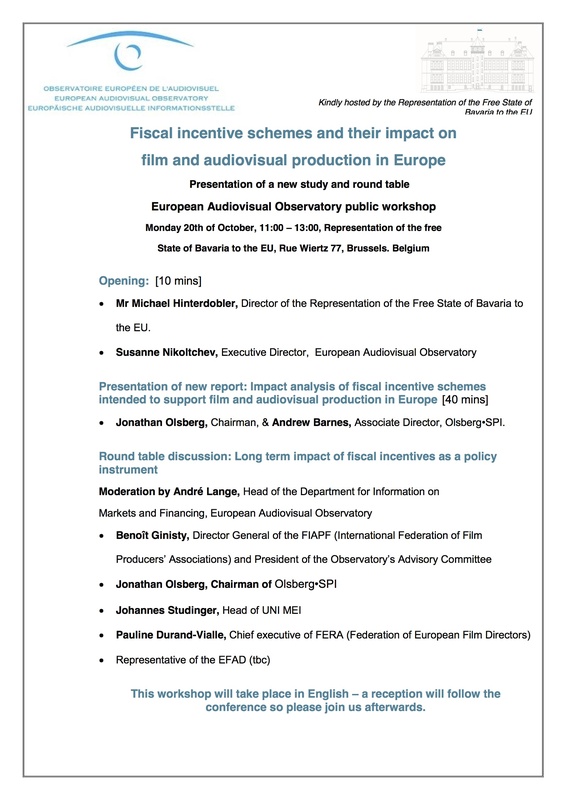 The Directors Guild of Cyprus and the Ministry of Education and Culture of Cyprus have been proudly invited to participate in the conference “Fiscal incentive schemes and their impact on film and audiovisual production” to be held in Brussels, Belgium on Monday 20th October 2014. A member of the Board of Directors of the Directors Guild of Cyprus is attending, where a presentation of a new study and round table on the Fiscal Incentives theme will take place. The event is kindly hosted by the Representation of the Free State of Bavaria to the EU, Rue Wiertz 77, Brussels. This free public conference will examine the impact of tax shelter, tax credits and tax rebates on film and audiovisual production in Europe. The European Audiovisual Observatory has commissioned a brand new study from Olsberg•SPI which examines the effects of fiscal incentive schemes in Europe. The findings of this new report will be presented at this conference by its authors. What other initiatives are needed to complement the fiscal incentive to deal with the anticipated needs of increased infrastructure as a result? How do you ensure a balance between growth of the domestic independent and international production sectors following the introduction of an incentive? What adverse effects could result from the introduction of an incentive? Link to the complete programme.